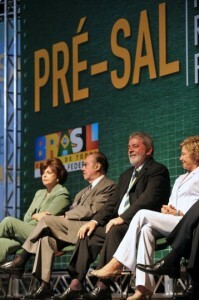 Lula and his team announce pre-salt regulation to Congress, photo by Fabio Rodrigues Pozzebom/ABR. RIO DE JANEIRO – Last week Lula and his government presented the new model for oil and gas extraction in Brazil, a plan to control the gigantic underwater reserves of the Santos Basin and the entire pre-salt area. Inspired by Norway, Venezuela and Russia, the Brazilian government aims to nationalize all oil revenue by radically changing the current extraction regulation. The new measures shake the market and rouse environmentalists already at odds with Brazil’s energy agenda. According to the new partnership model, which will probably replace the current concession regime, Brazil will be the sole owner of the pre-salt oil and will be entitled to eighty percent of its revenue. Furthermore, state-owned company, Petrobras, will be the responsible operator for all blocks, holding a share of at least thirty percent in each of them. The oil giant will also hold joint ventures with companies and be exclusively remunerated in oil barrels. Essentially, the state will control private-sector oil dealings. Lula and his government appear to be following Chavez’s and Putin’s steps this time. In fact, to support the heavy load of bureaucracy and operations in the pre-salt area, the government plans to create a new state-owned company called Petro-sal, which will take care of all the contracts and grant government control over every related business. Oil revenue will be invested in a social fund called: “Fundo Social do Pré-sal”, to aid the poor and finance health care, education, scientific research and ecology programs, following the Norwegian model. Thirty percent of the Brazilian population, or 57 million people, are below the poverty line. Petrobras’s latest tests show that extraction from the three blocks of the Santos Basin – Tupi, Lara and Parque das Baleias – should probably total between 9.5 million and 14 million barrels of oil, a quantity that doubles the Brazilian current oil production and gives Lula many reasons to be ecstatic about what he referred to as “Brazil’s second declaration of independence”. Through a triumphant speech the President of Brazil announced the regulation change, reinforcing the idea that Brazil doesn’t need to share oil property. Oil market specialists are not entirely positive about the Brazialian situation either. Many believe that Brazil still needs to cross quite a few technological frontiers in order to properly explore and exploit the underwater oil basins. Petrobras seems to be currently facing several mechanical problems due to the corrosive effects of salt and the high pressure at 5,000 meters below sea level. The technological limits and, most of all, the government’s nationalizing measures caused a quick reaction from the stock market. The Brazilian oil giant could suffer quite a lot from the loss of foreign partners and investors. Immediately after Lula’s announcement, Petrobras’ stock dropped around four per cent in value. Greenpeace activists are worried too. The ecological movement claims that, since the first pre-salt discoveries, the Brazilian government has not focused enough on bio-energy. Alternative fuel sources were of extreme relevance to Lula’s agenda until 2006, and at the moment all government efforts are pointing instead towards underwater oil extraction in the pre-salt area.